Kukurchita (litsea glutinosa, family: lauraceae) is a medium-sized evergreen tree with branches attaining a height of 7-8 m. Bark is grey and shiny. The whole tree is filled with wild smell. The tree grows here and there in Bangladesh. As a traditional medicinal plant, its leaves are used to make nutritious drinks, which relieve stomach-ache. It is also energetic and can cure many womanly diseases. Leaves are 7-20 cm long, slightly hairy, ovate, dark green in color. If crushed sticky leaves emit a kind of aroma. Small yellowish flowers bloom in clusters on the axil of leaves. Flower has many stamens, it looks like the earring of women. Flower blooms in summer (May-June). Fruits are round in shape. The ripe fruit is purplish black in color. Propagation is caused by seeds. Village children frequently use these fruits as the bullet of toy gun. Other local names: Menda, Pisla menda, Kajlipata, Fotekka, Roton, Kharjura, Karjuki. Shornolota or Dodder (cuscuta reflexa, family: cuscutaceae) is a golden-colored slender parasitic creeper grown on other trees. It clasps like cobweb, sometimes killing its shelter tree. It has branches. Many people think that it is a leafless plant. But it has leaves, those are scale-like, alternately grow from stem. The plant is well-mentioned in the Bengali literature, specially in medieval Baul poems. Flowers are small, white and thickly clustered, petals 5. Corolla lobe is short and triangular. flowering period is April-December. Fruit is round capsule. The juicy stem produces haustorium (a kind of tiny root) that help it to hold the host plant tightly. And with that kind of help sometimes the creeper covers its host plant completely. Its seeds can be germinated almost throughout the year. The propagation of the perennial plant is caused by seeds and cuttings. Pitalu or False White Teak (trewia nudiflora, family: euphorbiaceae) is a medium-sized deciduous tree with soft stem. Young branches and leaf backs are hairy. This is an indigenous plant of Bangladesh, as well as Indian subcontinent. Leaves are simple, green, ovate-cordate, 10-18 cm long and 6-13 cm wide, edge entire or serrate, apex acute, oppositely arranged. Petiole is 2.5-8 cm long. 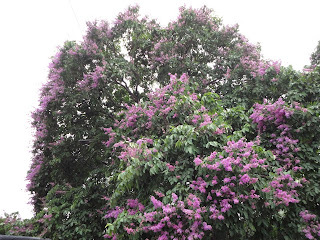 During the spring when flowering comes it seems to be the best flowering tree of the land. Male and female flowers appear on separate trees. Male flowers are borne on 20 cm long hanging spike inflorescence. Female flowers usually grow as single on long penduncle. Male flowers bear numerous yellow stamens. Female flowers have no petals. Flowering season of the tree is spring (Feb-Apr). Fruit is globose, 2-4 cm wide, 5 chambered. Fruit ripens in Oct-Dec. Propagation is easily possible from seeds. Gogon sirish (albizia richardiana, family: leguminosae) is a large-sized fast growing deciduous tree with cylindrical stem, dichotomously divided branches and smooth whitish brown bark. The plant is one of the most spectacular trees of the tropical world. It is widely planted as an avenue tree in Dhaka, the capital city of Bangladesh. Other local names : Rajkoroi, Bahari koroi. Leaves are compound, bipinnate, rachis about 12 cm long, pinnae 8-14 pairs, each 4-7 cm long; leaflets 50-100 pairs per pinnae, sessile, feathery, linear-oblong, small. Flowers are sessile, small, greenish white, numerous, clustered on round head. Flower comes in the rainy season. Fruit is long, thin, flat, whitish brown, 9-13 cm long and 2-3 cm wide. Each fruit contains 8-12 seeds. The plant is propagated by seeds. The tree with nice canopy can be attained up to 30-40 meters high. For its royal beauty, it is planted in park, garden, open space and street side around the tropical world.